We’d love your help. 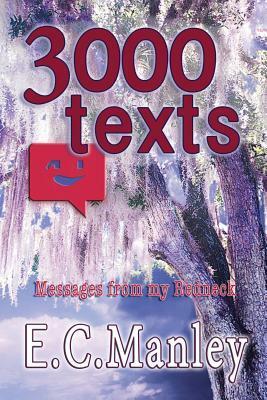 Let us know what’s wrong with this preview of 3000 texts by E.C. Manley. To ask other readers questions about 3000 texts, please sign up. Don Selasco I believe YOU are both romantic & a great mystery, blessed lady! Thanks for being my New friend & I wish I could meet you & FEEL this as…moreI believe YOU are both romantic & a great mystery, blessed lady! Thanks for being my New friend & I wish I could meet you & FEEL this as 'truth'! 3000 Texts gives an honest and thought provoking glimpse into the mind of one woman brave enough to give love a chance and the man she was betting on. Interesting character descriptions left me wanting to know more about the colorful Floridians portrayed in this page turner! I loved reading it from the beginning until the end. She held my interest throughout the story. I was curious what would happen next. Both the leading characters were interesting. Readers can easily connect with JD and the female character as their friendship and romance buds. JD is a shy man, but when he speaks everything he says comes alive. This fascinates the other main character. She has stopped living her life and realized this. She sets out with friends on a vacation where she meets JD. He manages to capture her attention right away. He also holds her attention throughout the book. The leading female character started out with assumptions as to what this JD person is like. This scene hooked me in so deep. Because, we all rush to our own conclusions about people before getting to know them. When she does meet JD for the first time, she realizes that he’s nothing like she thought he would be like. The moment this happens it made me connect with her. I find this masterpiece as an excellent way in portraying humans and how we really are. The romance was the final touch in making, 3000 Texts an amazing novel. The characters were not the usual perfect and rich individuals like in every other book. These characters were realistic and believable in a real non-fiction sort of way. Their emotions and actions were raw and unhidden. 3000 Texts has a beautifully well written plot. This is one reading adventure everyone will enjoy. I have read many books in my lifetime and none can compare to this one! It’s unique. Want to read something fresh, new, and exciting? Then, I highly recommend readers everywhere to pick up a copy up this stunning piece by E. C. Manley. You won’t be disappointed, when you do! We've all been there, you know, you meet someone and they become the subject of every thought you have from the moment you wake in the morning until you can finally fall asleep at night. This book is a story of just that, she takes us from the moment of meeting through months of courtship. You think, is what i'm wearing OK? Does he even like me? Two people from very different worlds colliding. Is this right? Is HE right? Everything is so perfect but in a different sort of way. It is a very easy We've all been there, you know, you meet someone and they become the subject of every thought you have from the moment you wake in the morning until you can finally fall asleep at night. This book is a story of just that, she takes us from the moment of meeting through months of courtship. You think, is what i'm wearing OK? Does he even like me? Two people from very different worlds colliding. Is this right? Is HE right? Everything is so perfect but in a different sort of way. A sweet and funny little love story. I smiled through out and giggled several times. Easy to identify with the main character and a quick read to curl up to for a day in the sunshine. I enjoyed it thoroughly. A good book makes it hard to put down. This was a cute story of how two different world can mesh together to become one perfect, happy life. I enjoyed reading the banter back and forth through their text messages and can't wait to read how their life ends up in the next book. It was a sweet way to watch a couple come together. A great story about the places love can take you. The author opened up her heart and let us inside her mind. 3000 Texts kept me up late into the night, not wanting to put it down to go to sleep. I can't wait for the next book!!! Just finished reading this at 2pm today and only purchased it yesterday at 1pm. That's should tell you something. Off to buy part deux!!!! Great book! I couldn't put it down! I can't wait for the next one! I wanted to like this book, I really did! I won this book in a Goodreads giveaway. The aspect of the long distance relationship interested me and was something I could relate to, so I decided to give it a go. The best I can say about this book is that it is authentic and raw. It is written in such a way that I was reminded of my own personal diaries. Those qualities may be extremely appealing for some readers, but I, unfortunately, was not a fan. The book felt too unfinished for my taste, and in m I wanted to like this book, I really did! The best I can say about this book is that it is authentic and raw. It is written in such a way that I was reminded of my own personal diaries. Those qualities may be extremely appealing for some readers, but I, unfortunately, was not a fan. The book felt too unfinished for my taste, and in my opinion, lacked a plot that kept me hooked. The question you have to ask is, is it ok to publish someone's private messages? *** The format on the kindle preview is not displaying correctly, but the downloaded book on the kindle or free ereader looks like it should. Do not read it from the cloud reader, that looks bad too. It looks good on adobe digital editions reader, on B&N and KOBO too. It should be good to go on ibooks any day now. I won this book from goodreads in exchange for an honest review. This book was a mixed bag for me. I found the main character/author to be easy to relate to. We've all been in that position, where life throws you a curve ball and you approach what it has to offer with caution. That made the love story aspect of this book very cute to me, and at parts it was like rereading my own journal. There were parts I just didn't connect with and they bothered me enough to take away from the starred rating. I won this book from goodreads in exchange for an honest review.